Those two–the sound technician and director of the open air theater in Mörschied–really know how to create suspense. Over 1000 people in the audience are suddenly as quiet as church mice. There’s not a soul on the stage…but…a hoof beat can be heard. Then, at full gallop, two beautiful Friesian horses hitched to a stagecoach burst through the stone gate into the arena. The coachman is fantastic. The horses are absolutely in synch. Tears well up in my eyes every time I see it. It’s a scene from another time and another world but it’s also now because you’re right in the middle of it. And…the Wagnerei Hauck had a hand in it. In the winter of 2013-2014 I got a rather unspectacular inquiry…only a couple lines and a picture: “Could you build something like this and how much would it cost?”. After mailing back and forth a few times, I was off to Mörschied and met people full of incredible idealism and energy! Arndt Limpinsel (the boss), Sascha Klein (the doer) and Eric Nisius (the all-rounder and wonderful master painter). Then we got started! Where can you see an American stagecoach? Where can you get the measurements and details? Tips came from contacts in the USA and Switzerland. The Swiss family Nussbaumer at the Ägerisee already had something like we wanted to build so…we went to have a look feeling somewhat like spies but we left as good friends. We actually found original plans in the USA. One of the best carpenters that you could ever wish for, Raphael Bauer from Grafing (whose workshop is in the neighboring town Alxing) jumped on board and built the cabin. Only about three months had passed and we needed help again…this time from our “coldbloods” Ivan and Aaron…for the test drive. Now it’s tradition. Every summer we make the trip to Mörschied to see the latest production on the open air stage at the Karl May Festival. A great show, great actors and a fantastic stagecoach. 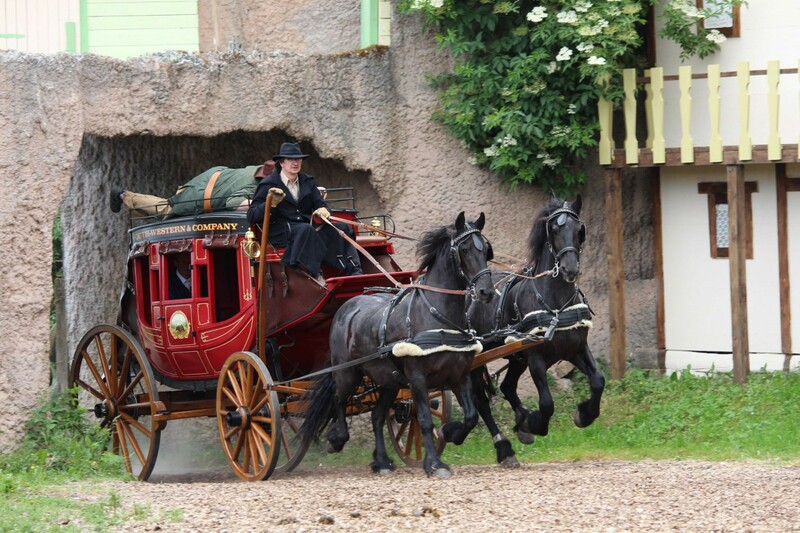 Pulled at a full gallop, the stagecoach bursts through the stone gate into the Wild West arena. I arrived as a spy at the Nussbaumer's and leave as a friend. A suspenseful moment ! Everything actually fits together. Testdrive with our "coldbloods" Ivan and Aaron - Raphael Bauer and Andreas Hauck on the box.